For the oh so many people that have been asking me about this, I can at last confirm that this years Macclesfield #Twissup is go! As you can probably guess from the lack of updates, since we decided to kill the “Macc To The Future” idea through lack of interest (it seemed a great idea when we were drunk), things have been a little quiet.. I stand and solely take the blame for this, as for many reasons which are now thankfully all gone, I’d lost my drive to drive the event as much as I had in previous years. But thankfully due in truth to the support from you guys, and in particular I’d say Matt at the Treacle too for pushing me on, we going ahead as planned on Saturday 22nd August 2015. What has made it trickier this time around is that there has been so much going on behind the scenes. Toby at RedWillow building a new brewery, Chris closing and reopening a new, larger and much improved Brewtique, and Bronwyn and Tim with their network of fine establishments. So we decided to take it back to basics (#MaccToBasics) and just go with a great social drinking theme. No big beer launches (unless of course anyone fancies it), just a great range of beer and food, a good crowd of friendly people having a beery bimble around the usual haunts. 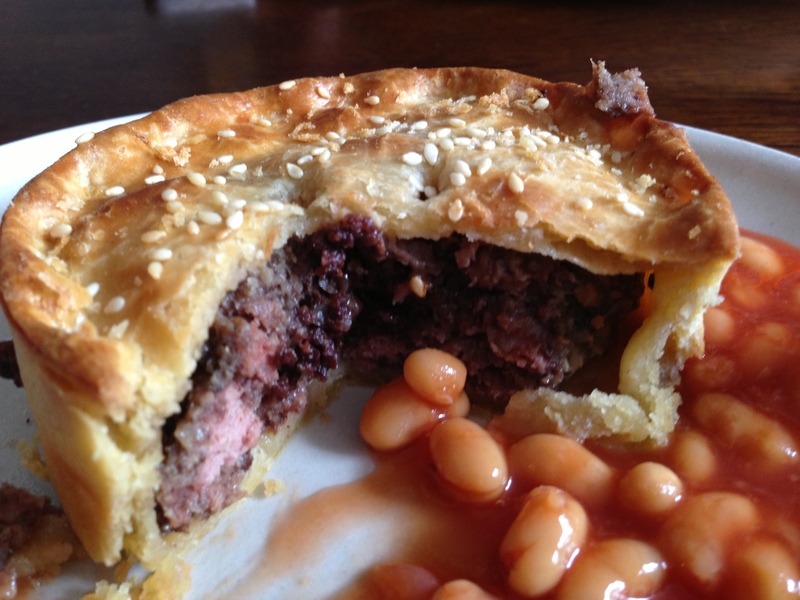 So far we have the return of the amazing Great North (breakfast) Pie Co at The Treacle Tap as our starting point at 11AM. Where we will also have the pleasure of an informal Meet The Brewer session with Marble and I’m sure a fine selection of their beers tbc. 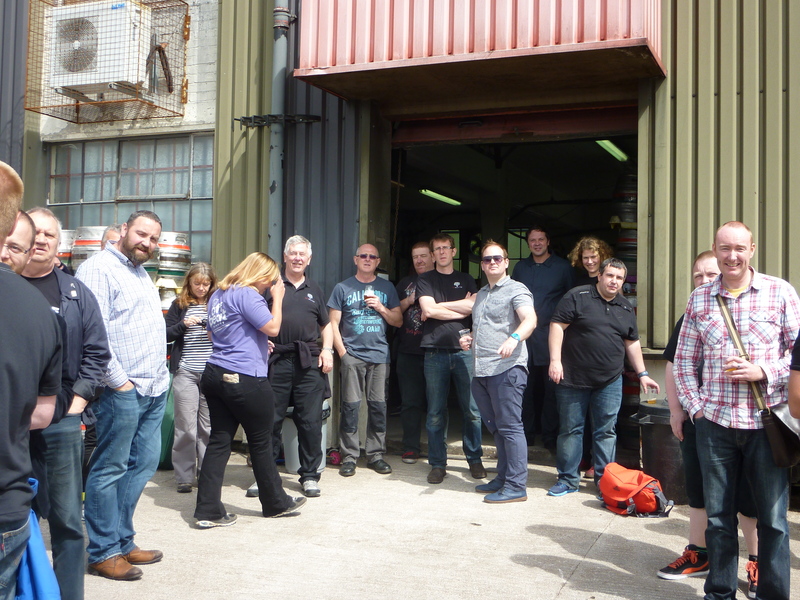 Toby is again opening up RedWillow brewery for us to try a few beers and take a look around the new brewery building so that you can see it as a work in progress. Chris at The Wharf is escaping on holiday, but again is happy to welcome us and put on some “cellar specials” as well as the normal top range. He is also hoping that folk will take an excursion up to the new shop which now has beer on tap including a dedicated sour line. It’s probably not feasible for us all to go “en-masse”, but we should have plenty of time to visit as they are open all day till late. Finishing off the day as last year in RedWillow Bar, which I am sure will have enough to keep you all happy on the cask, keg and gin front among other things. 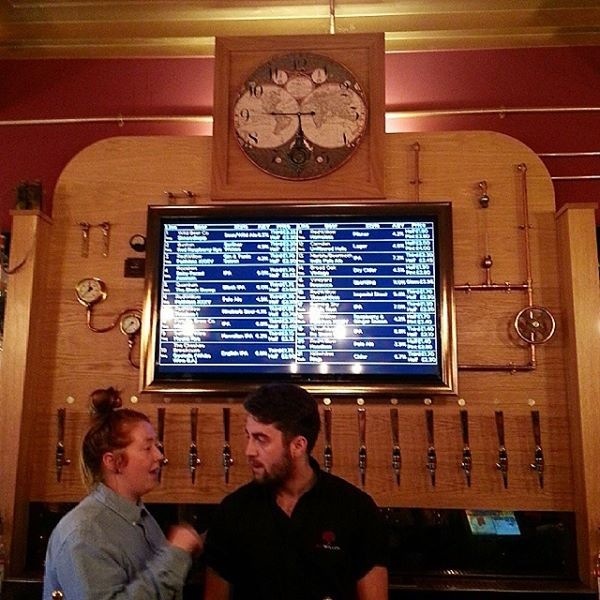 Molly and the team will I’m sure pull out the stops to make the days beer board as amazing as last year. Full details to be confirmed for all venues as soon as I have them on the likely beer lists, venue timing itineraries, food etc. “So keep em peeled”. Hope to see you all soon. 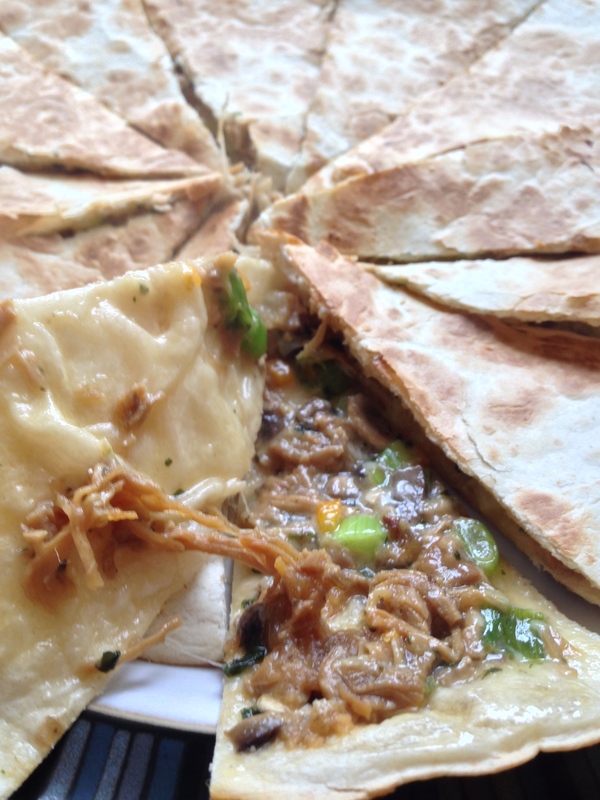 That’s right, pulled pork quesadillas! Whoa there vegetarian types! Don’t dash off just yet, we can get around this pig related dilemma, stick with it. Although clearly this dish has meat in it, you can replace it, or just leave it out as you wish. This recipe isn’t rocket science, but I had it yesterday and just thought “wow, this would be great beer food”, and some folks “may” not have tried quesadillas. So, clearly my creation requires pulled pork right, but I’m not going to go all in-depth on how to make that or we’d be here all day. But what I will say is that for this recipe it needs to be pretty dry so if yours isn’t, maybe drain it off, or cook it down so it has no real sauce to speak of for this recipe. In brief, for my pulled pork, I used a large leg joint of “pork” (obviously), although generally shoulder is better. There’s no magic spicy rub mix required here as I wanted to go a bit less smokey barbecue and more with the apple thing. I just sealed the meat by frying it off with a spray of oil in a deep sided roasting pan to sear all sides, paying extra attention to the skin side to help get all that flavoursome fat rendering down right away. Remove the meat and set aside. Peel, core and roughly chop two decent sized apples and one large onion, fry them off a little too in the same pan. Place the pork on top. Add a decent bottle of apple cider, a sprinkle of dried sage, thyme, rosemary, salt, ground black pepper, a heaped desert spoon of dark brown sugar and a teaspoon of smoked paprika. Tightly cover with foil and slow cook for about 4-5 hours. Remove the pork from the pan and try to take off as much fat as possible, then shred the meat roughly and mix in with the remaining sauce back in the roasting pan mashing the apple and onion mix as you do to thicken. Add a good splash of Calvados or Bourbon to taste. Cover again with foil and return to the oven for a few more hours if possible, basically cook on until there is as much sauce left as you personally prefer. Easy! If like me though, when you choose that joint of pork, your eyes are much bigger than your belly (a tough act in itself), inevitably you will have loads of delicious meat left over which is where this recipe comes in. Right, to work. Take a large mixing bowl. Into that, finely chop a handful of spring onions, four or five mushrooms, a fresh chilli or to taste (I used half a Scotch Bonnet which was really zingy, it was just enough) and a roughly chopped fistful of coriander, (I actually used the frozen pre-chopped stuff this time and it worked really well). Grab a heap of the leftover pork and chop/mince with a chefs knife to basically make it less stringy, throw that in too. Season with a little black pepper. 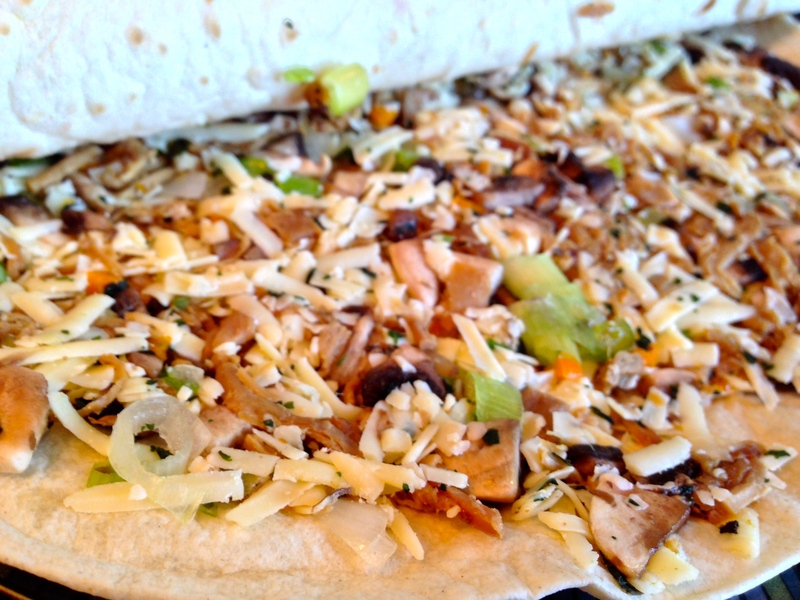 Finally, grate in a good hunk of mature cheddar or similar, basically you want a good cheese to additions ratio.. I know, I’m just TOO precise.. Mix all the ingredients together gently, use a spoon and not your fingers, take it steady or else it just all goes into a massive gooey clump! 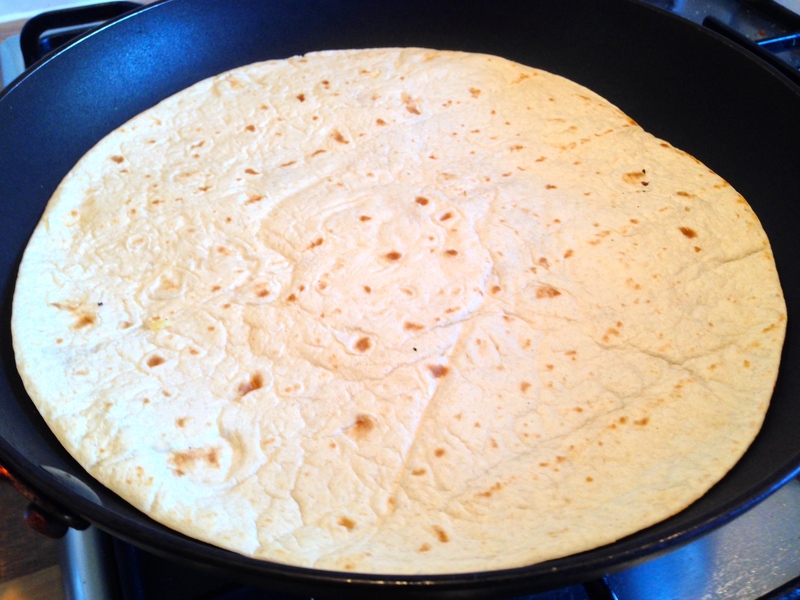 Take three large tortilla wraps and lay them on a work surface, spread the mixture evenly between them all to take the dry mixture to about 1 cm from the edge. Lay another wrap over the top of each and give them a firm press down. 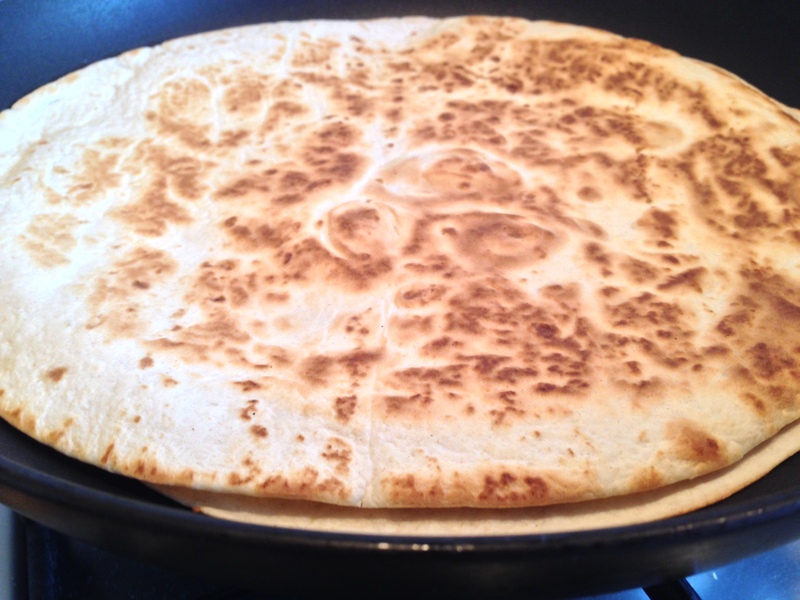 Using a dry frying pan on a medium heat, cook the quesadillas for about one and a half to two minutes each side, turning as required. You are aiming for a piping hot melted centre and a nice crispy outer, so try to get the cheese melted a little before the first turn. I suppose you could oven cook or worse, microwave, but I’d definitely recommend sticking with the dry pan option for best results. Slice like pizza into bite size portions and serve on a warm plate with sour cream and guacamole. It is DELICIOUS! Beer wise, I’d go with something like a crisp Kölsch, or perhaps a really light hoppy IPA, you could even go mad and sort of mix the two with one of those new fangled India Pale Lagers. Hope you enjoy whatever you choose. Everyone loves to bag a cheap beer don’t they, or at least a decent beer that doesn’t break the bank, a BOGOF, three for a fiver or a cheeky little discount here and there. But how far can it go? How often do we hear about the demise of the British high street, it’s all over the news, in the papers and on many a documentary. It’s all too clear when you walk into town too, well it is around these parts at least. Even in Hanley which is known as the “shopping centre” of the Potteries, the place that is credited to have sucked the life out of all the other local towns, walk a few hundred yards from the “Intu” centre and there are more boarded up shop fronts than those open for business. It’s not that I’m against supermarkets stocking decent beer as such, I’ve been moaning about the piss-poor selection in most for years. In fact even now I still always take a look down the beer aisle just to see if anything decent is in, often wearily trudging away, shaking my head at the assumed lack of thought that has gone into the stock choice. Going back eighteen months or so, we had the “faux-craft” knee jerk reaction, as some of the big retailers realised how much money was at stake if only they could convince their existing bulk suppliers to rebrand or create something “crafty” at production line prices. Personally speaking I think only M&S managed to pull this of with any success, by selling existing products like Oakham Citra under their own banner whereas others like Tesco for example, chose to go the other way with the “Marstons Revisionist” range, which absolutely sucked among many more. More recently of course, things have started to look better, with Waitrose, M&S, and even Tesco and Morrisons trying a little harder, with a small range of decent UK and International breweries finally getting shelf space, the two premium retailers taking the lead. Not forgetting Sainsbury’s of course who made strides with “the great British beer hunt”, but still seemed to favour current supermarket brands when choosing winners. 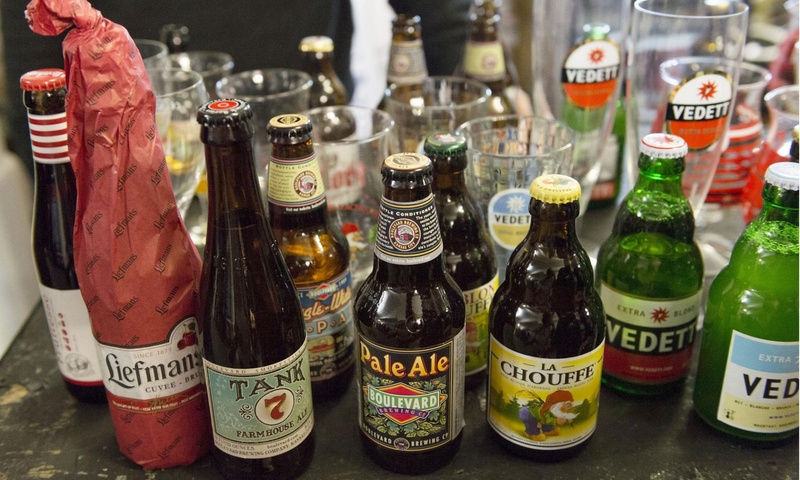 Looking at the picture which came from the Lidl headline though, my eyes were immediately drawn to the “Boulevard Tank 7, Single Wide IPA” and “La Chouffe” bottles. I’ve always been a fan of Chouffe beers especially (Houblon) and although only trying it recently for the first time, Tank 7 was absolutely lovely, Single Wide IPA too. It is worth noting that (unless I’m very much mistaken) all these brands are owned by Duvel Moortgat, having being acquired at various stages over the last 10-15 years. Amongst others not shown, including Bernard, De Koninck, Maredsous and Ommegang of whom I also think they held a founding stake. Is that itself a good thing? I still like most of the brands listed above, but it’s not rocket science to see that a deal has clearly been struck here between multi-national beer giant and huge discounter, to supply to a bargain hungry beer guzzling public. But then who is next to be swallowed up, the “small micros” also mentioned, or even bigger “cult beer” fish? Then of course there are the independent specialist beer retailers. Shops, micro-pubs and bars. Those places that folk either really want nearby on their high street, or has, and perhaps complains that they do, but can only rarely visit because the prices are just too high and so are “forced” into supermarket purchases. What of those, how long before the huge purchasing power of the shopping giants starts to close those one by one because they simply can’t compete on price? Déjà vu, or pessimistic scaremongering? It is fair to say that I have completed no real in-depth research to back any of this up and as such it is pretty much only my own thoughts/concerns. It is also worth pointing out that I’m not knocking any of the few breweries lucky/successful enough to secure a supermarket deal either. As an argument for, you could say for example, deals like this make good beer accessible to everyone and in doing so, gets more people interested in trying something new. Maybe the only way this ever expanding growth in beer can continue is that some do fall by the wayside, or the reverse, are bought out and go mainstream replacing existing big brands. Although, I definitely hope that this isn’t the future. Personally speaking I’ve just taken a decision to try really hard to support local high street traders where possible, not just in beer purchases, but for as much as I possibly can on everything. Which speaking from the town officially listed as having the most empty shops in the UK this year isn’t easy, but seems the only way to encourage positive change or face the consequences..
What are your thoughts, is the discount store the way to go, your only route, or a potential disaster in the making? There is a reason for posting this apart from the fact that Leigh and Zac are both great guys AND you don’t really need a reason to visit Beerritz. I’d like to get a few events like this going in the Stoke/Cheshire areas and wanted to get a feel for the number of folks that would be interested? #7point5 came about as a result of discussions revolving around several blog posts at the weekend and the previous week. These all referred specifically to the recent changes in beer duty which saw taxation increased by 25% on beers over the 7.5% abv threshold. Several ideas were muted, including an online petition to the Treasury, writing to local MP’s amongst other things. We wanted though, something that could be used as an identifier on Twitter, Facebook and other social media when information was posted and after a few ideas were knocked about settled on #7point5. Personally for me, the aim is to write an ongoing series of blogged reviews featuring higher strength beers from the UK and international breweries. They are not going to be full of moans and groans about the woes of beer taxation, unless of course that is the post relates to something specific along those lines. However they hopefully will serve to highlight the fact that not every beer affected by the legislation is drunk solely for it’s high alcohol content, these are beers to savour like a lover of fine wine or malt whisky would. If nothing else it should help dispel the misguided belief that after drinking an 8% beer, most people are not compelled in any way to go out and mug anybody, do a bit of looting, or sleep rough around the back of the “offie”. So, as from today, anything that fit’s the bill from me will feature the #7point5 tag over the next few weeks, months or as long as.. Ultimately trying to raise a wider awareness of the change, the potential impact it will have and the real reasons behind it. Hopefully enough people will get behind the force for a change back to a sensible level of duty across the board. To a level of taxation which is fair to all drinkers and supports the beer industry, not a duty levied on the false premise of stopping the antics of high strength lager swillers. To that end I’d also like to invite/encourage any fellow beer bloggers to either write a guest piece for Beersay, or to write a piece on their own blogs under the same banner if that’s preferable. Even if you are not set up to blog yourselves, but fancy having a go at a guest piece, feel free to contact me or leave a comment below. Not long now until the Nantwich beer and food festival weekend, a chance to indulge yourself in some fantastic beer as well as a vast array of fab foodie treats too. 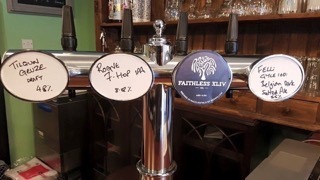 I’ve attached a link to some of the local beers that will be on show from the likes of Red Willow, Beartown, Merlin, Off Beat, Marbleand many, many more. A date for your diary here folks.. 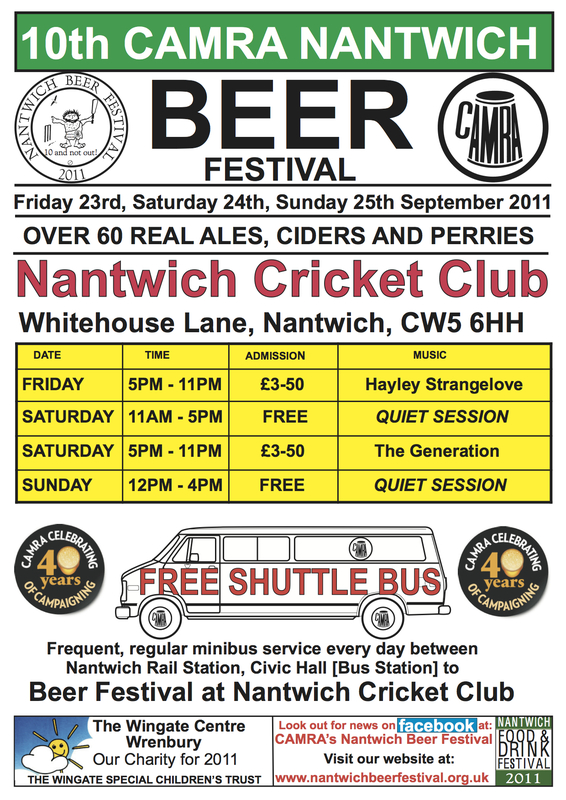 I bumped into a couple of friends from CAMRA Cheshire recently, at the Bhurtpore Inn Beer Festival. They stuffed a flier in my hand and asked if I would give their upcoming beer festival a plug. I’ll give it another plug nearer the time, be great to see you there. Sign me up to Beersay! Blood, Sweat and Otter’s Tears…. The big three double O..